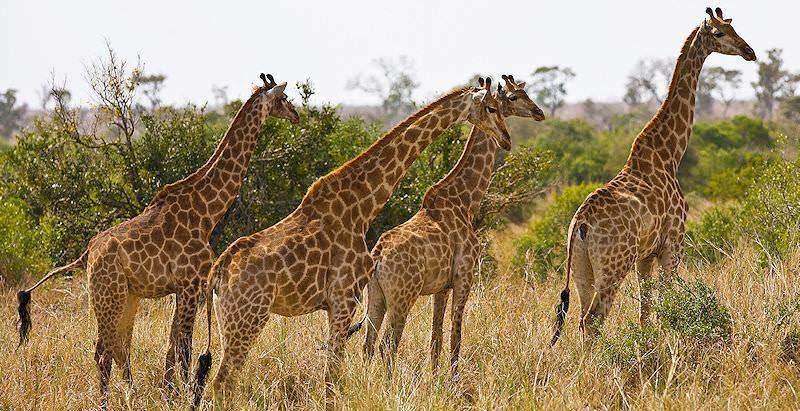 The stately giraffe is the world's tallest land mammal and a remarkable animal to observe on safari. The Giraffe is the tallest land or terrestrial animal on Earth, with its sometimes over 2 meter long neck helping it reach great heights. If this very distinct characteristic doesn’t yet fully help you identify a giraffe then its tan coat filled with brown patches of fur and its short horns will. Both males and females have these horns, but males generally have no hair on these horns due to fights. Males can grow to be well over a ton in weight, roughly 1200 kg on average (+- 2600lb) while females generally reach 830 kg (1830 lb). Giraffes are very scattered over Africa, in different protected areas, some many kilometers apart. In South Africa they only naturally occur with great numbers in the Kruger National Park going into a small area of Mozambique. Namibia, Angola and Botswana also have a significant portion of land among them where Giraffes can be found. Kenya and Tanzania, as with most animals, also provide enough protected land for them to naturally flourish, including parts of Ethiopia more north. Next to lake Malawi and within Zambia they also reside and in West Africa where a few secluded areas of land contain Giraffe inhabitants. Giraffes are regarded as healthy as a species and in no harm or threat to either endangerment or extinction, giving way to their status as least concern. Their wide range and healthy population indicate this, but there are a number of sub-species all over Africa that show us another side of the story. Some of these sub-species are vulnerable to endangerment and thus the diversity of the species isn’t as healthy and strong as their overall population. Habitat loss and illegal or over hunting are the main causes for the decrease in some of their populations. The Giraffe’s height is no party trick but is crucial in obtaining its favorite meal at the very top of trees, new, soft and green leaves. A typical giraffe friendly environment inevitably needs to have enough trees for them to feed on, but also requires a perennial water source to hydrate their huge bodies in drier areas where due on leaves cannot fulfill their need for water. They most frequently feed on acacia trees in woodland zones of the Kruger National Park and can greatly contribute to preventing overgrowth in denser areas. They are well equipped to withstand sharp thorns on trees with their very coarse tongue which they wrap around leaves and pull into their mouths. Giraffes can be seen in groups, but do not form long lasting or close groups for the most part, only really relying on others when they are confronted by the same urge or the same danger. Giraffes do communicate with one another, especially visually thanks to their size and the ability of others to see one another from afar because of this. They are most frequently seen with other Giraffes when the respective home ranges of these individuals overlap. These individuals aren’t associated with one another and aren’t lead together either which brings up the question of whether they can be called a herd. They are silent most of the time and aren’t very vocal animals, but do possess the ability to communicate vocally with one another although primitive. Typically calves calling out to their mothers are the most common form of vocal communication between these animals. Furthermore dominance, defensive and antagonistic displays and warnings come in the form of a change of posture or two giraffe males charging at one another, swinging their necks and horns at one another. They regularly feed with other Giraffes on a single acacia or thorn tree, and it is then when they assemble loose herds. When a bull spots and identifies a cow in heat, he follows her and fends off competition for her up to the point that the two mate. Courtship involves fore-leg lifting adopted by many antelopes together with licking and rubbing between the pair. They sniff or test one another’s urine before the bull mounts her in a very clumsy and uncomfortable display. Gestation periods for these poor females are very long, between 14 and 14 ½ months on average, and it is because of this reason that they need around 16 months to recover and raise their young before repeating the process. Females mature sexually at age 4 while Males only really start competing for mates at 7 years of age. Lions, the kings of Africa pose the greatest threat to Giraffes who remain large unfazed by the presence of predators. Calves however are more easily threatened and are heavily protected by their mothers who kick at attackers, sometimes with an instant blow killing them right there. Mothers generally stay within a 40m radius of their calves to keep a close watchful eye at all times. The same defense strategy is used when adults have to defend themselves, but their added speed and good vision make it even harder to bring one of them down. Large bulls may also seriously injure Lions who come after it as females do to the enemies of their calves, but with aggression driven by the need for survival rather than maternal instinct. South Africa boasts unparalleled diversity as an African travel destination. Botswana is one of Southern Africa's most beloved safari destinations. Namibia is a vast desert country known for its alluring natural drama. Travel to Zambia for a unique and authentic African safari experience. Zimbabwe's most famous feature is undoubtedly the Victoria Falls. The Kruger National Park is renowned for its beguiling natural beauty and abundance of wildlife, including 147 different species of mammals. The Sabi Sand Private Game Reserve couples unadulterated wilderness with the zenith of luxury safari accommodation. Cape Town is an exciting African tour destination, offering thrilling activities like cage diving with great white sharks. The Garden Route is a lush coastal area known for its bewitching scenery and ample adventure-oriented activities.